1. 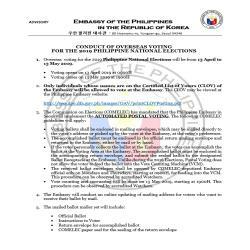 Overseas voting for the 2019 Philippine National Elections will be from 13 April to 13 May 2019. •	Voting ballots shall be enclosed in mailing envelopes, which may be mailed directly to the voter's address or picked up by the voter at the Embassy, at the voter's preference. •	The accomplished ballot must be enclosed in the official return mailing envelope and returned to the Embassy, either by mail or by hand. 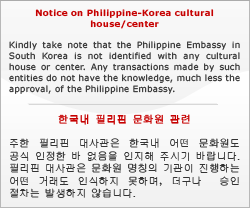 •	If the voter personally collects the ballot at the Embassy, the voter can accomplish the ballot at the Voting Area at the Embassy. The accomplished ballot must be enclosed in the accompanying return envelope, and submit the sealed ballot in the designated Ballot Receptacle at the Embassy. Unlike during the 2016 Elections, Postal Voting does not allow the voter to feed the ballot into the Vote Counting Machine (VCM). •	The received ballot envelopes shall be opened by COMELEC-deputized Embassy official only on Mondays and Thursdays, starting at 0900H, for feeding into the VCM. This procedure can be observed by accredited Watchers. •	Vote counting and canvassing will be done on 13 May 2019, starting at 1900H. This procedure can be observed by accredited Watchers. 4. The Embassy will conduct an online updating of mailing address for voters who want to receive their ballot by mail.